The South Park neighborhood of Seattle is a racially diverse one. Their residents come from every ethnic, cultural and racial background. The neighborhood also has a large proportion of single mothers raising kids, a lower household income than the rest of the city, and a large number of residents with less than high school degrees. It is in this neighborhood where a unique elementary school shines like a beacon for the residents, providing hope of a better future for thousands of students. Concord International Elementary School is a bilingual school, where every student – no matter what their cultural background – learns English and Spanish. They also learn computer skills, social studies, mathematics, history and many other disciplines of studies. But more than that, they are exposed to the possibility of a better education, a wholesome education that will take them far in their lives. All of this is possible to the wonderful environment that the school principal, Dr. Norma Zavala, has nurtured. Dr. Zavala came to Concord International in 2009 when she was appointed by the district superintendent to serve this particular school. 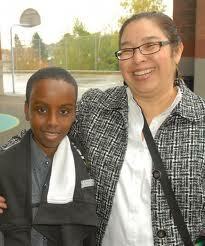 She has helped create an environment of trust and enthusiasm among students, parents, teachers, staff and volunteers. The classrooms are filled with joyous kids, none of whom are strangers to Dr. Zavala. She knows their names, their parents’ names, their personal histories and their needs. Norma Zavala is a Mexican-American woman, who has dedicated her life to education, especially of Latin@ and Hispanic students. She has an undergraduate degree in Physiological Psychology from the University of Washington, a Masters in Education from the University of Washington’s Educational Leadership and Policy Studies program and a Ph.D. in Educational Leadership from the College of Education at the University of Washington. She serves the students with passion and creativity, two very important qualifications when you work with elementary school children! Dr. Zavala has been an advocate for Hispanic and Latin@ kids for decades, and continues to show us that you can use the resources at your disposal, even if they are not all what you wish you had, in order to better the lives of thousands of kids and their families. She is also an everyday hero; her work will continue to transform lives and for this, Dr. Norma Zavala is one of our Everyday Hispanic Heritage heroines!